And More... Click Here for a Complete Schedule! "The best decisions are made from information and logic." Do you believe that? Is it a fact? What if it were just an assumption? What if you had the option to change this assumption or at least add new assumptions to the mix? How would it affect your ability to make better decisions in the future? We all operate on a set of beliefs that drive how we think and act. We believe "X" to be true so we do "Y." But many times the things that we believe are not absolute facts - they are simply assumptions - and as long as they remain unquestioned they limit our options. September 6, 2007 • Los Angeles, CA • Register Now! Join us for a fun evening of networking and socializing with the tech savvy community of Los Angeles! Come one, come all, bring your business cards, and schmooze with us as we enjoy the good company. Prizes to be raffled during the evening and a complementary drink ticket will be awarded to the first 50 attendees! 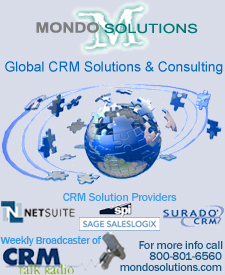 Established in 1995, Mondo Solutions has become a worldwide leader in providing CRM Business Consulting Services & Solutions for Sales, Customer Service and Marketing organizations. CRM Solutions include Sage SalesLogx CRM, Sage CRM, Netsuite, Surado CRM and Sales Methodology Solution Selling. The Alternative & Quantitative Investment group, which sits within UBS Global Asset Management, is a globally integrated business created to provide alternative investment solutions. As Chief Technology Officer (CTO) for A&Q, the individual will have responsibility for managing the global technology resources of the entire A&Q platform including the single manager provider, O'Connor, and the two distinct multi-manager providers AIS and AFA. This includes management of employees, contractors and external vendors/providers working on both Run the Firm and Change the Firm technology related initiatives across the platform which comprises a direct team of ~60 IT professionals. WITI is pleased to support GoingGreen Executive Summit on September 10-12, hosted by AlwaysOn and U.C. Davis Graduate School of Management, and we wanted to make sure you were invited. As you will see in the speaker list outlined below, GoingGreen is where cutting-edge greentech CEOs meet the movers and shakers from the biggest industries on earth. Green technology innovators are transforming the global energy, water, agriculture, transportation, construction, manufacturing, and resource recovery establishments - trillion dollar industries. This two-and-a-half-day executive event features CEO presentations and high-level debates on the most promising emerging green technologies and new entrepreneurial opportunities. As an important partner of WITI, we are pleased to extend to you and your associates a 50% savings on tickets to the GoingGreen Executive Summit. Click here to take advantage of the discounted ticket price we have reserved for you and any of your associates. • Participate in seminars to bolster your skills as an entrepreneur in the areas of growth and capital. • Attend a round-table discussion with an expert in the area of your choosing. • Pitch to a room full of venture capitalists and angel investors. • Network with investors in the venture and angel communities and entrepreneurs who have followed this path. Apply today for the opportunity to pitch to investors! • There are a limited number of opportunities to present your pitch at the forum. • If you are chosen to present, you will work with a coach, an expert in the field, to prepare and perfect your final pitch.